The current world record carp The Scar was captured at a weight of 92lb by a British angler at Les Graviers in France. The big question remains when the 100lb barrier wil be broken. Mark Ryder was one of the few lucky anglers that get a chance to capture the current world record carp nicknamed The Scar (or the Scarred Mirror) from French Fishery Les Graviers at an impressive weight of 92lb. According to The Northampton Chronicle Ryder and his fishing mates also caught a few other big carp during their weeklong stay in France. In 2010 The Scar broke the world carp record when it was landed at 99lb, just shy of breaking the miracle barrier of 100lb. Given the weight the huge mirror carp gained of the last couple of years it is very well possible that the 100lb barrier will be broken next year. 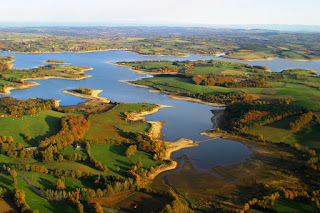 Anyone that's want to give it a shot at Luke Moffatt's Les Graviers near Dijon in France has got to be very patient, since the Lake is fully booked for the 2012 season. On October 1st of 2012 there will be a new opportunity to make a reservation for the 2013 season. Check out everything about Les Graviers right here or visit the Luke Moffatt website.